The following story originally appeared on Frederick's Blog and the original article can be found here. The growth of Aussie rules football in the US has been a slow, steady, but satisfying journey. The United States Australian Football League (USAFL) was originally established in 1996 and is currently based in Sun Prairie, Wisconsin. Americans and Australian ex-patriates alike have been able to get the word out about the historic game, and the excitement of footy is finally coming to American shores on a large scale. In the 1960s, the Victorian Football League (VFL) tried to expand its international audience by promoting what they called the Australian Football World Tour in 1967 and 1968. It was initially conceived as a way to develop international rules football – a hybrid sport featuring representatives from both Aussie rules football and Gaelic football – but also became a way for international audiences to see various elements of footy up close and personal. Games were played in Dublin, London, and New York City, but the tour was discontinued after 1968. The VFL (now the AFL) also tried to play various preseason exhibition matches overseas in American cities – such as Portland and San Francisco – as well as two consecutive games held in Miami in 1988 and 1989. Most recently, the Sydney Swans battled the North Melbourne Kangaroos in a 2006 preseason game held at the UCLA intramural fields. As far as a US-based league goes, the USAFL was founded in 1996 and incorporated as a formal competition the following year. Many of the American players had developed a passion for footy during the 80s, when VFL/AFL matches were televised on the then-fledgling ESPN network. Some of the original footy clubs in the first two seasons were the Cincinnati Dockers, the Louisville Kings, the Nashville Kangaroos, the Boston Demons, the North Carolina Tigers, the San Diego Lions, and the St. Louis Blues. The USAFL has gained some passionate champions in Australia. Some of the current USAFL ambassadors include such big names as former Brisbane Lions superstar Michael Voss, AFL Hall of Famer Leigh Matthews (former Brisbane and Collingwood coach), and Hawthorn icon Robert DiPierdomenico. These men, in particular, have helped the USAFL gain international credibility as a top-level footy league and as an avenue to help establish and develop the sport in the States. Currently, the USAFL is divided into three separate regional leagues, which all have their own tournament during the summer season. In all, the USAFL has 37 men’s teams and 13 women’s teams. The USAFL Nationals tournament is held annually in October, with the location changing each year (the 2017 edition will be in San Diego). 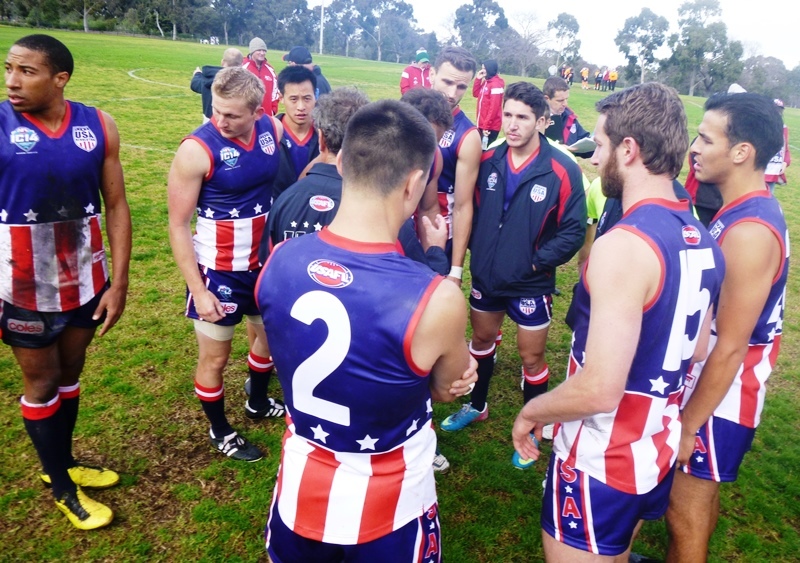 The best American footy players get a chance to participate in the triennial Australian Football International Cup and (in alternate years) the 49th Parallel Cup, which pits the American team against the Canadian team. The Revolution (men) and the Freedom (women) are the names of the International Cup teams. The Revolution have competed in every International Cup since 2002, with their best finish coming in 2011, when they received fourth-place honors. The Freedom joined the party in 2011 and 2014, finishing in third place both years. As of today, there are 2,000 registered footy players in the US, with many more on the way. The AFL has conducted more tours of the States in recent years, including combines in many major cities, and are working to place more development officers throughout North America. Sanford Wheeler (played 1989-1994) – Born in California to an African-American mother and an Australian father, Wheeler moved to Parramatta (a western suburb of Sydney) at age six. He first picked up footy as a teenager before getting drafted by the Sydney Swans as a defender. Unfortunately, Wheeler played for Sydney during some of their worst seasons as a club and was de-listed by coach Ron Barassi in 1994. Jason Holmes (played 2015-present) – Originally from Chicago, Holmes played college basketball at Morehead State University and was signed as an international rookie by the St Kilda Football Club in October 2013. After spending time with the VFL’s Sandringham Dragons, Holmes made his AFL debut in 2015 as the first born-and-raised American to ever play in the league. Dwayne Armstrong (played 1996) – Armstrong, a former American football player for Iowa State University, attempted to transition to Aussie rules with the Essendon Bombers. While he never made a start in any AFL games, Armstrong gave a solid effort at lower levels of competition, both with Essendon’s VFL squad and also with Wanderers Football Club in the Northern Territory Football League. Mason Cox (played 2016-present) – A former walk-on basketball player for Oklahoma State University, Cox is the tallest player in AFL history, standing at an imposing 6’11”. After being spotted by AFL scouts in the States, the ruckman showed plenty of raw talent when he landed in Australia, starring for the Collingwood Magpies’ VFL reserve team in 2015. Cox made his AFL debut in 2016 during the annual ANZAC Day clash (Collingwood vs. Essendon) and kicked the game’s opening goal. Seamus McNamara (played 2010-2012) – McNamara played basketball for Marist College before switching to Aussie rules in 2010, signing an international scholarship with Collingwood. McNamara played a handful of preseason games for the Magpies before being delisted in 2012. He stayed in Australia and ended up going back to a basketball career.